Handcrafted Wood Products – Decor Deals for Your Home! Why is it that natural REAL wood is so much nicer than those “laminated” or “wood-like” products? I don’t know about you, but in my opinion, there is nothing quite so beautiful as simple, hand crafted wood! No “almost wood” stuff for me, thanks but no thanks! Across the country I see artisans who can transform a plain piece of wood into one-of-a-kind works of art and I am always inspired by their dedication and understanding of beauty. Not to mention their skill! I have also found that “reclaimed” wood products are unique and beautiful as well. How clever to take a piece of wood that supposedly has no further value and reclaiming it and making it a useful and artful product that brings comfort and coziness to the home! At Bellacor, we believe home is a life in progress. Since 2000, we’ve made it our goal to partner with you through every step of that journey. We understand that what you choose to bring into your home is a major decision, and we relish the responsibility that comes with it. You put your style and life together in all kinds of ways – and no one offers you better choices than Bellacor. We give you the elements and the design inspiration to create a home and life you love. Chic, fun, classic, cozy – we go where you want. Even though we’re a fast-growing internet retailer, we maintain our humble Midwestern roots and values. We still take your phone calls, still answer all your questions and still offer you the same level of personal service that we have from the beginning, back when we were the little lighting store around the corner. But with more than 500,000 hand-selected products, from the finest designers and craftspeople in the industry, Bellacor stands tall in the world of lighting and home furnishings. And we’re happy to stand with you as you tell your life story. You First – We deliver a superior shopping experience through our knowledge and expertise, provided in a caring, honest and inspirational way. Collaborate Always – On our own we’re good, but together we’re great. We’re collaborative, positive and fun. We treat everyone with respect and the highest integrity. Constantly Improve – We’re innovative and willing to take calculated risks. We learn quickly from our mistakes and adapt nimbly. Deliver Great Results – We strive for excellence and hold ourselves accountable. And here are a couple of their lovely pieces! We offer remarkable designs by independent makers, and our goal is to do it with a positive impact on both people and our planet. In 1999, our founder Dave Bolotsky visited a Smithsonian Museum craft show in Washington D.C. and was captivated by the variety of unique handmade goods and the talented people behind them. He saw there was a significant public demand for beautiful design. At the same time, he realized that the artists working to make those pieces were often traveling great distances in order to sell their wares at the show. Inspired by his experience, Dave had a vision to create something that had never existed before—an online marketplace to connect makers and their creations with individuals looking for truly special goods, regardless of the physical distance between the maker and the shopper. Dave turned this idea into UncommonGoods. He continued traveling to craft fairs and trade shows, meeting artists and finding stand-out merchandise, while running the business out of his home on the Lower East Side of Manhattan. Before long, the company had outgrown Dave’s apartment, and moved through three successively larger offices in downtown Manhattan, eventually settling in our current location in Brooklyn, NY. Along with sustainability, supporting creativity and the artist community is extremely important to us. Today our assortment has grown from a collection of Dave’s trade show finds to a plethora of products handpicked by a full-fledged buying team, who scour the web for the latest in creative design and, just like in our early days, hit the road to bring back treasures from around the country. Thanks to our community of artists and designers, we also discover many unique pieces through online product submissions. Additionally, we’ve grown an in-house product development team, who work hard to create new goods sure to make even seasoned design junkies swoon. As we enter a new age of business, we’ll remain focused on our commitment to sustainability and creative design. We’ll never stop working to provide a remarkable shopping experience to our customers, make our company our team members’ favorite place to work, celebrate craftsmanship and innovation, and support our community of artisans, designers, and creative thinkers. We have a feeling the future will be uncommonly good. And here are some of their other handcrafted wood products. These coasters are absolutely adorable! And since I love to crochet, this little gem is a must have for me! Reclaimed wood and real handcrafted wood products are an excellent addition to any home decor. You know that wood brings something earthy and magical to your home, so think about investing in a beautiful work of art made from real wood! I also have some articles on the brief history of stained glass, hand carved wood, handmade pottery from Nicaragua, stained glass lamps, handcrafted wooden boxes called Waka Huia, handcrafted wreaths, tapestries, the beauty of stained glass, pottery by hand, people that create art with their hands, and carving wood into art. I hope you take a few moments to read them and thanks so much! For more about me, go to the About Me page above. Also check out my post on quick and easy winter home decor fixes for your master bedroom and my post on 4 simple winter home décor ideas to make your living room cozy this winter! You are so right about all natural wood. It’s so beautiful and grounding. There is nothing quite like it. I lovee that wooden lazy susan! What an incredible way to make something old new again. That is so cool. I’m really into that old, vintage farm look. It makes everything feel a little bit more home-y. I really appreciate your style! Thank you so much Helen! We obviously have the same taste in decor! I hope you visit my site often. Excellent products, I have always loved wood in its natural state and often wondered how this craft is created. This article explains the basis of what I had wondered and now I know. Thank you for this great product and look forward to reading more about your creations. Again, thank you. Thanks so much Xavier. I love wood too! I’m glad you liked my article and I hope you come back often. Have a wonderful day! I really love real wood. I think it is a shame that today it is becoming harder and harder to find great real wood furniture. Everything today seems to be made of particle board. I just hate that. Thank you for bringing such beautiful pieces to my attention. I will certainly look at all that you have to offer. Hi Cynthia! I know what you mean, it makes me sad when I look at some of the furniture out there. I have always had a love of real wood, it just makes me feel good to look and touch wood products and to understand their beginnings in nature. Thanks for taking a peek at some of the reclaimed products, and let me know how you like them! Thank you Brenda for sharing this interesting post with us, I love wood, used to do a lot of woodwork in my childhood at school, it is a great and beautiful medium to work with! I think I took after my father, who has “golden” hands when it comes to wood! Reclaimed wood is an excellent way to get beauty with functionality, not to mention to do our little bit for Mother Earth. Hi Orion! I’m glad you enjoyed my post. I can’t quite put my finger on it, but I know when I am around real wood products I feel like I am a part of nature. The warmth and beauty just can’t be overstated. You are very lucky to have had woodworking when you were growing up. I’m sure it has given you a deeper understanding of beautiful works of art made from wood. I am also sure that Mother Earth appreciates those who have learned how to use reclaimed wood for beauty! Thanks for your comments! I do take on several wood projects each year. I do like the heart coasters. Last year I made some cabinets for the lake garage out of old wood flooring planks. Reclaimed wood is getting more valuable each year as the number of old homes are going away. 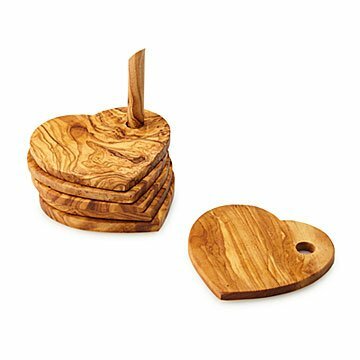 Next Post Handcrafted Wooden Gifts – Beautiful Decor Deals!